Still not convinced that high tax rates are causing wealth and income to escape from New Jersey? The Wall Street Journal wrote a very powerful editorial about the Boston College study, noting that New Jersey “…was once a fast-growing state but has now joined California and New York as high-tax, high-debt states with budget crises.” But the most powerful part of the editorial was this simple image. 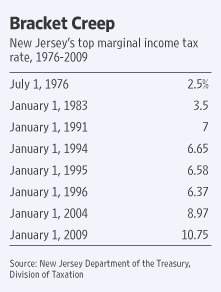 Prior to 1976, there was no state income tax in New Jersey. Now, by contrast, highly-productive people are getting fleeced by a 10.75 percent tax rate. No wonder so many of them are leaving.